Udupi, Apr 27, 2017: Udupi DC Priyanka Mary Francis has said action would be taken against the contractor who was in-charge of the quarry for the tragedy that killed a mother and son at Durganagar. The DC, who made a spot visit, stated that she has instructed the Mines and Geology Department officials to penalise the contractor for negligence. “The unit was functioning about four years ago. It had become defunct and the contractor was issued notice to fence the property, but he failed to do so. Hence, action will be taken against him. A meeting will be held to discus the fencing and other precautionary measures to be taken up to avoid deaths in quarry pits,” she said. 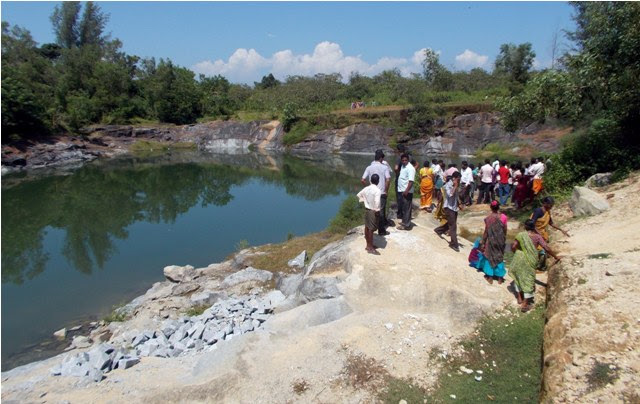 The District Mines and Geology Department senior geologist Kodandaramaiah said that the district has nearly 99 quarry units and a few black stone quarries, adding to 108 functioning units. There are also 50-60 defunct quarries. He added that Rs 1.30 crore was released to fence the defunct units in the 2016-17. The tender is called and the survey work is handed over to KRIDL but is yet to be completed. Once the survey is completed, the dangerous quarry units would be fenced. Speaking at a meeting to form a task force to take action against the offenders who fail to fence the quarry units the DC said the district has recorded around 72 victims drowning in these quarry units since 2011 – 15 people in 2011, 28 in 2012, including 17 children, 11 in 2013, including eight children, three children in 2014, six in 2015, including three children, five in 2016, including three children and four in 2017, including two children. The DC has warned the quarry operators to fence the area within 15 days or face legal action. Although the units have stopped functioning, it is imperative on the part of the contractors who held the positions earlier to fence the units. The officer said that the draft circular on the formation of the task force at gram panchayat-level should be discussed for the final outcome. She ordered the Women and Child Welfare Department officials to initiate measures to start the child help line in the district. The greed for money makes them do so , the quarry was defunct but why had they left it unfenced ? The accident occurred due to the negligence of the quarry owner. as the labourers usually prefers the river side ad such place to wash clothes and so on / Don’t their life have any value? Why do they keep the quarry pit open ? Do they wait for such incidents to happen?